What a difference a day makes ……. On Saturday afternoon whilst setting up the fencing and signs around the transition area, the sun was shining with a slight but chilly breeze, however it was still quite warm. Many hands make light work so the task was completed quickly. The last time I consulted the ‘XC Weather App’ it said ‘Sunday 10deg at 07.00 rising to 14 by 11.00… North East wind 15 / 20 mph’ What to pack? … Everything!!! Spaghetti Carbonara for carbs and a reasonably early night as I had a 07.06 start time. No need for the alarm – I was up at 04.00, then again at 04.30 and 5.00 – I was awake…. Was the morning chorus a bit louder than normal? Was it my birthday? Was Santa coming? 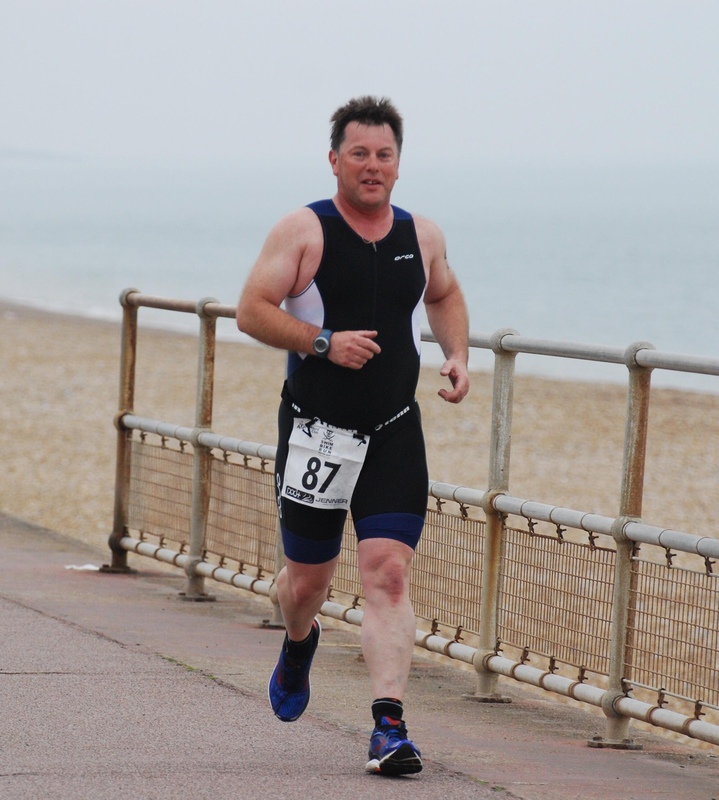 None of the above – it’s Hythe Bay Tri day …. As I sneak down stairs things are already running through my head – swim steady, save legs for the return bike, remember ‘foot down’, Adey’s dismount instructions from Tuesday night and just get through the run – sorted. After coffee was made I opened the back door …… ‘Oh it’s a bit chilly out there’ (that’s the polite version!!! ), however I think I covered every weather ‘eventuality’ with kit so no problem. Bottles filled, bike and kit loaded into the car it’s off to Hythe. On arrival at the registration, everyone was being greeted by a smile and warm welcome. That done, race number drawn on my arm, labels stuck onto bike and helmet, bike checked over it was off to setup transition. Just before 7am it was off to the pool. Taking off my jersey, the ‘chill factor’ hit, however after a quick walk I was inside. There I met up with some friends and club members doing their first event. We were thoroughly briefed, informed of specific rules and headed down to the swim start. Gradually the steps got closer until it was my turn to get wet. Down the steps, swim cap and goggles on, I’m ready …. From the ‘Go’ my mind went to mush…. All the preparation and planning disappeared into a fog … In practice for the last 6 months I have been averaging 29 second per 25mtrs lengths – not today – I recon I was doing 25 / 26 second lengths until number 6 where I eventually ran out of puff and had to ‘drag’ myself through the final 4 lengths. Out of the pool and off to transition 1 …. Who needs a tri belt with your number??? I was in such a rush to ‘get out’ I dropped it, got to the end of the racking before I realised. Back I went pulled it on and headed out. Run out to the ‘bike start’ was fine and off I pedalled. Foot down at the end of Twiss Road and onto the course. I have ridden from Hythe to Folkestone many times so know all the lumps and bumps by heart. The marshals along the route encouraging the riders were brilliant and the signage good. Being colour blind, I was unable to see the ‘road hazards’ marked in red last year, however the change of colour to baby blue, or was it white this year? – not sure but it helped – thank you. The rest of the ride was incident free, apart from my ‘young’ friend overtaking me like I was stationary. I had a very brief thought of ‘I can catch him’ which lasted about 10 seconds followed by ‘get real he is under half my age’…. I think I did quite well with the ‘Adey’ dismount demonstrated on Tuesday evening. Both feet hit the tarmac running – shame the legs thought different at this point…. Up the steps onto the seafront wobbling along with jelly legs but hey I’m on the final stretch, what can go wrong?? As said before my mind had gone to mush … I know all these this are necessary and good hydration prevents cramps. Normally I would follow the rules rigorously – why fail now? Encouragement from the guys at the turn point / water stop and Paul B kept me going until finally the end is in sight. From about 500mtrs from the finish line, the cheering started and mysteriously the pain went as I crossed the line like a gazelle, well maybe that is a bit of an exaggeration, however I made it. Being greeted by smiling faces and congratulations from all the ATC members, kids handing out the medals and water on the finish line; seeing family and friends was wonderful as was the achievement of finishing. The support and encouragement that is given throughout the event is fantastic. The professional, efficient and friendly way the event is run filters to the athletes allowing them to perform to the best of their ability. The setup is straightforward and easy to navigate, briefings informative and there is always someone to hand if help is needed. The Hythe Bay Tri should be an annual diary date, whether a seasoned triathlete or beginner it’s an event for everyone….